The Fynes house is slowly getting back into the swing of things, organizing like most is on top of our list for this month. To be honest is a bit of a daunting job. I think every room has one area that needs major attention. I decided not to overwhelm myself and start small. The bathroom has been taken over by my jewelry, and since Santa gerously brought me 4 new necklaces and a bunch of earrings it was only going to get worse, so a Jewelry Organizer was a must on my to-do list. 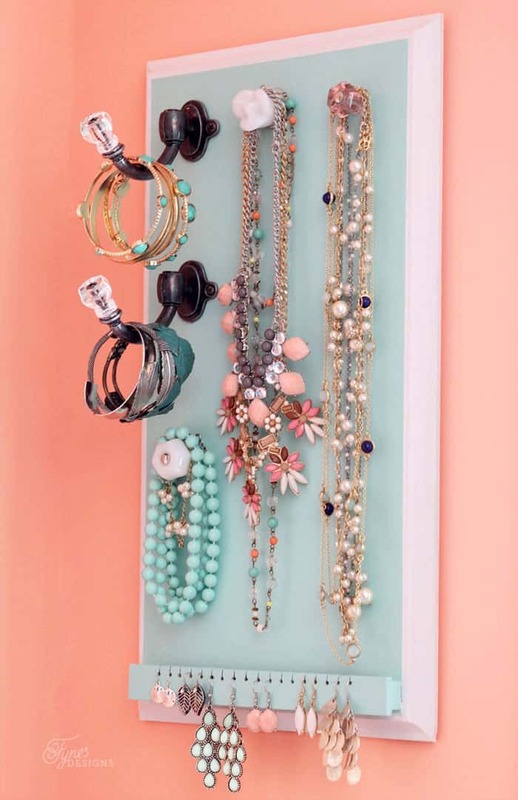 There are loads of jewelry organizing ideas out there. 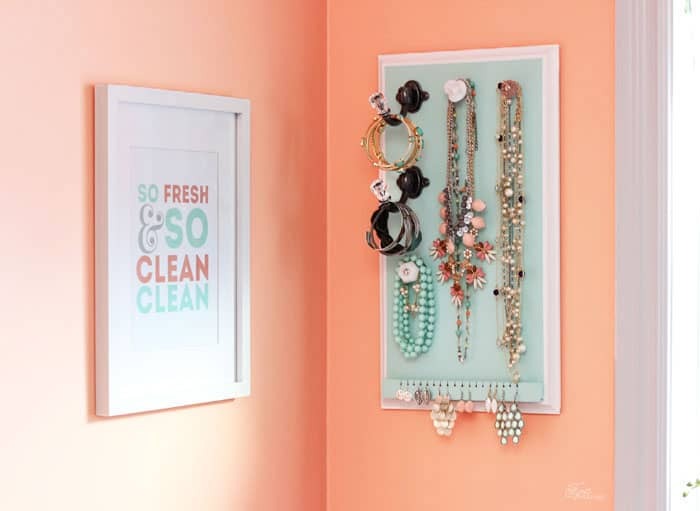 Cabinets to buy, things to repurpose, and lots of plans for DIY jewelry organizers (like this fabulous design from Shanty to Chic, this easy solution from Lil Luna, or this attractive idea from Charming in Charlotte). I wanted to create something that was a bit of all of those ideas combined- not too hard to build, attractive and most importantly easy on the pocket book. I actually pulled this together with things I had in my workroom from previous projects. The pine board from last months DIY Vintage Sled, the knobs from the DIY Stocking holders, and trim from the birch centrepiece. The design for this Jewelry Organizer is quite basic. I started with a 1 x 10 x 18″ pine board (if I were to make it over I think I would make it 22″ long. You can buy 1 x 10″ by the foot, so it is quite inexpensive, a Metrie concave trim board (an 8′ piece is about $5), and paint stir stick. 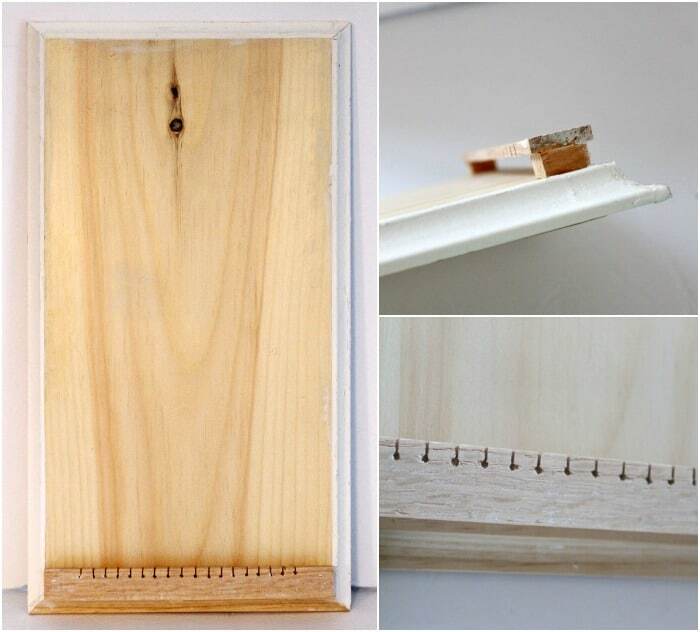 Using a mitre saw cut the trim board according to the length of your pine board. Adhere to the outer edge of the board with wood glue and secure with your air nailer or small finish nails. Cut the paint stick according to the width of your main board. Drill small holes along the length of the paint stick 1/2″ apart, using a jig saw cut the edge of the board to meet the holes. Using a small block of scrap wood raise the earring board along the bottom of the pine board. Attach with wood glue and a nail. Fill nail holes and sand to finish. Paint with desired color. I used Voice of Color Sweet Nothings (PPG 1140-2), and Delicate White (PPG 1001-1) for the trim. Attach the cabinet knobs and hooks to finish the jewelry organizer. Can you believe how simple that was?! I love how it turned out. I think the Sweet nothings color really made it pop! I only included a storage solution for dangling earrings as I don’t wear them as often, I have a little dish for my studs. The glass knob hardware from D. Lawless Hardware looks like jewelry itself, isn’t it so pretty? 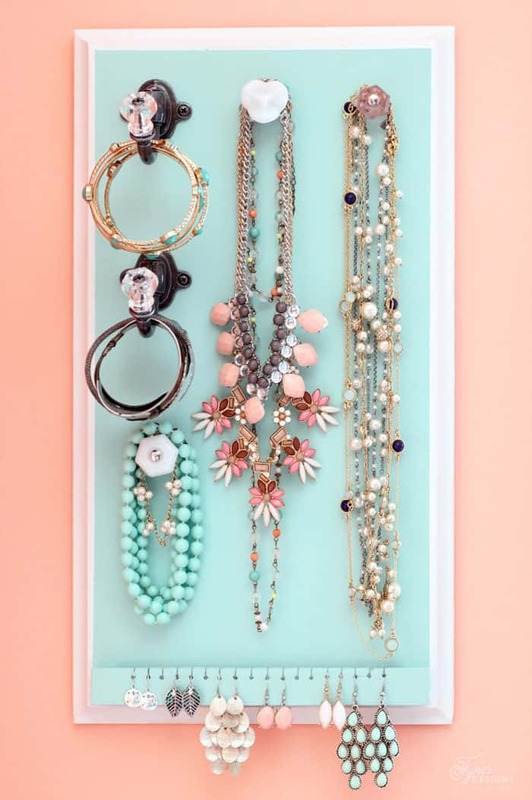 This jewelry organizing solution is perfect for my small bathroom, and really cleans up my insanely cluttered bathroom windowsill! Thanks for visiting today, I hope you’ve got 2015 off to a crafty start! Amazing! 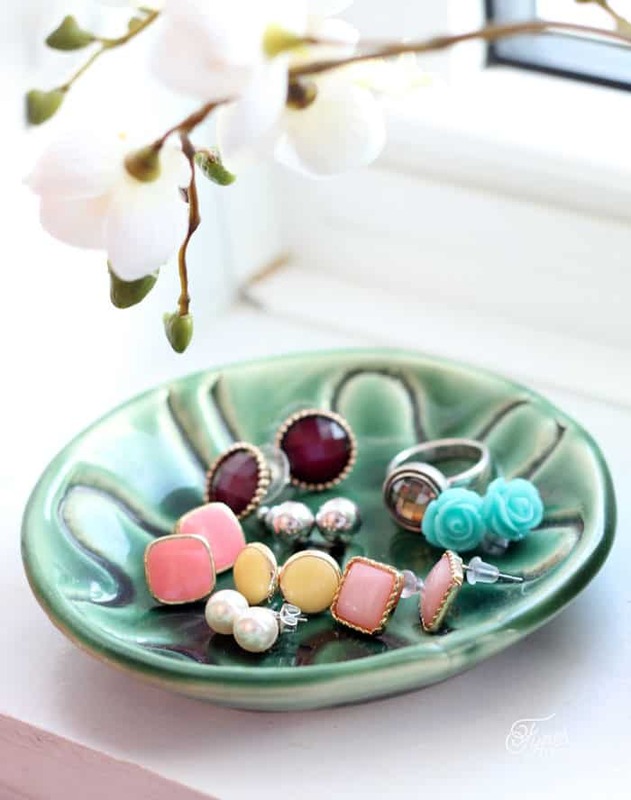 What an easy way to dress up your bathroom AND have your jewelry handy! Looks so pretty! I could definitely use something like this for hanging my necklaces! First, Virginia ! 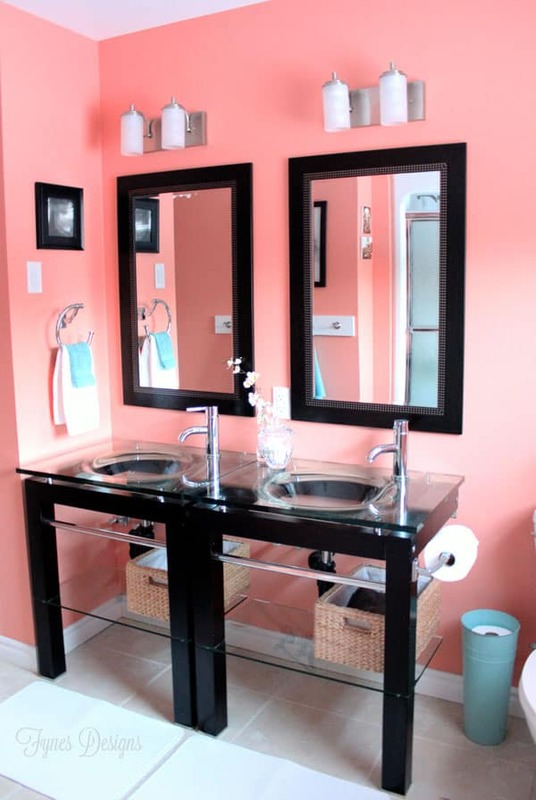 Your bathroom is so colour coordinated! Even your jewelry works with your colour scheme. How do you do it, woman? Second – LOVE this. It’s amazing. I love how you worked the earring holder into the piece. Genius. Thanks Tara, this might be the only room that all works together, I may have fallen victim to last years colors! SO pretty! I just love how functional it is too – the earring bar at the bottom is genius. So beautiful! 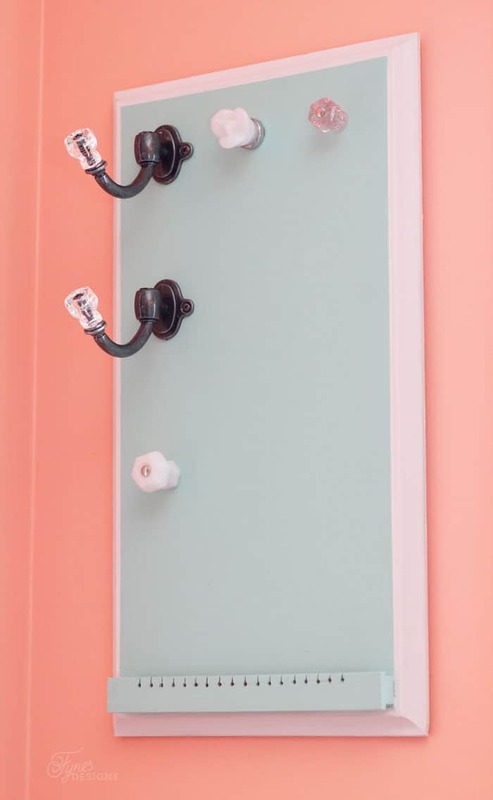 Love the different knobs you used for hanging. And that color is perfect! I think I have an obsession with all those colors! Love this Virginia. The earring bar is genius. I need to make one for my daughter! Thanks for the idea and how to. Glad to have you at the linkup party! Pinned for later. How pretty! When we redo my oldest daughter’s room, I’m going to make one of these. Thanks Erlene, You’ll be surprised how easy it comes together! Sounds easy! My daughter has been asking for something like this, I think I will give it a try! Pinning! I love how you added the hooks for bracelets- genius! And I adore that color! Just gorgeous Virginia!!! 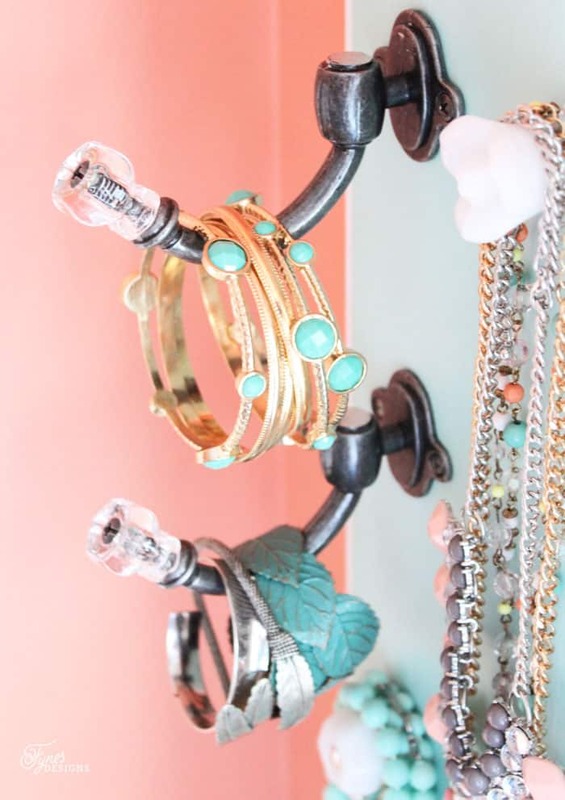 What a lovely way to display jewelry! Thanks SO much for linking up to the Frugal Crafty Blog Hop this week!!! Happy Friday girl! This is so pretty! Thanks for linking up at the Thoughtful Spot Weekly Blog Hop! We hope you stop by again next week! This is the perfect project! I know my sister would love something like this. Thanks for sharing. Pinning. I would love if you linked this up to Totally Terrific Tuesday. It goes LIVE Monday’s at 9pm CST. Hope to see you there! Love this! 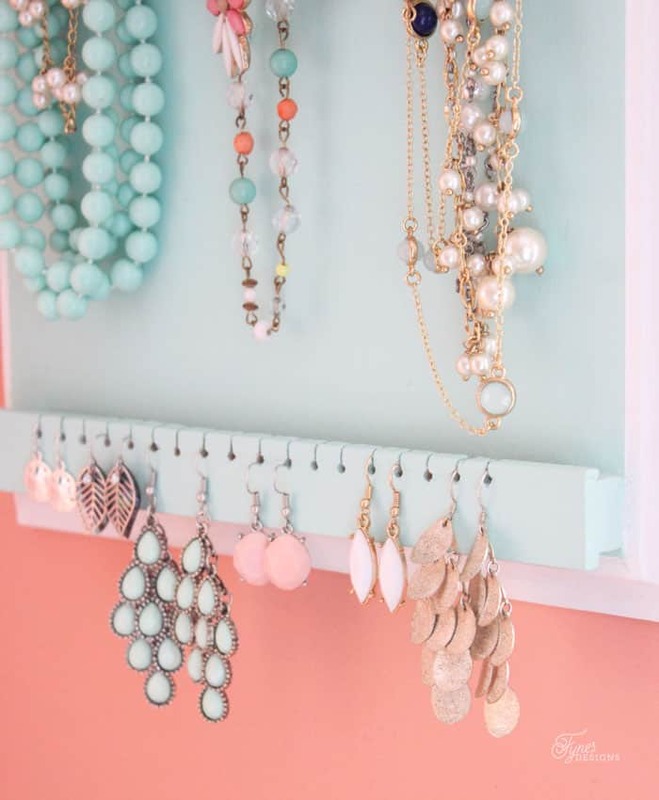 Such a simple but pretty way to display all your jewelry. Love the color you chose to paint it, too! just gorgeous and so handy! Thanks, so far soo good, it was a great DIY project for my little bathroom! Great DIY! Thanks for sharing with us at Throwback Thursday. Hope to see you again this week. It looks amazing, Virginia! I made one last year for all my jewelry but yours is more classy, love it!